We all strive to be better—or even the best—but how do we get there? Well, to steal a lyric from The Beatles, we get by with a little help from our friends. Some of SCN’s Top 50 integrators (and others) were willing to share their knowledge on the industry’s hottest topics—here’s what they had to say. It’s easier than ever to work across the globe. If there wasn’t a different accent on the other end of the line, you probably wouldn’t notice your colleague in England was an eight-hour flight away. So how do you maintain your company culture across the miles? And that culture doesn’t just include your full-time employees—don’t forget about contractors. “Work with local talent wherever possible as you build your own presence in-country. But you have to vet them heavily—and plan to constantly manage/supervise them to maintain your quality and customer service standards,” said Matt D. Scott, president, OMEGA Audio Video. Sometimes a partnership can come easily, as it does for those in the PSNI Global Alliance, according to several of its members. “Our affiliates in the PSNI Global Alliance enable us to support our customers’ needs across the globe…not subcontractors, but our partners taking care of our company and our customers’ remote locations as if they were their own,” said Robby Turner, executive vice president, sales and marketing, Data Projections. One last tip on globalism? “Watch out for local codes and customs, always check them to ensure compliance,” concluded Scott. It’s the buzz word you might be sick of: experience design. But there’s a reason AVIXA keeps pushing the design message—experience designers are moving into the fold quickly. Helmer also emphasized the need to train your AV integration salesforce—otherwise, she says, it could lead to a misunderstanding with the customer. Verrex’s Shinn recommended that integration firms not only sell (and train their staff on AVaaS), but all the non-project specific services a company offers. Doing so, in addition to partnering with other non-competitive service providers, will be mutually beneficial and can broaden a company’s network and company base. Finally, Turner advises avoiding any kind of misunderstandings by ensuring you’re working with the correct person. “Understand your client’s role in the decision-making process. 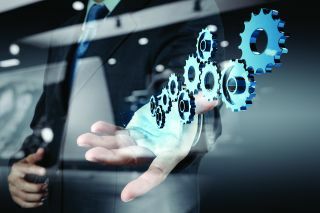 More than ever, it’s critical the CFO is involved in the process to fully understand the AVaaS value proposition,” he concluded. Huddle rooms are popping up everywhere—real estate is at a premium and clients want to maximize space with open floor plans. This is a prime opportunity for integrators to push collaboration spaces. The need for a private meeting space is obvious, but the struggle is real—especially in terms of making the technology easy to use. AV and IT, AV and cyber security, we hear it all the time. But are integrators taking the proper precautions to ensure client data is safe?